We are pleased to announce the launch of some exciting projects that we’ve been working on here at ReviverSoft over that past few months – all of which have come about from the valuable feedback we have received over the years from you, our customers, visitors to our site, and respected industry leaders. 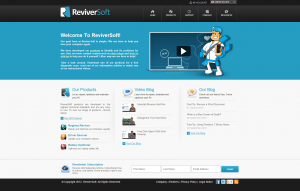 Welcome to the New ReviverSoft.com! 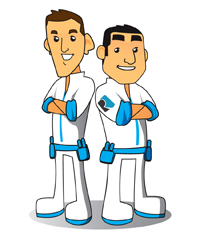 Our goal with our website is to make sure that you can easily get to the information you need. Whether this is for product support, information about your account, reading the blog, watching how-to videos or downloading any of our award-winning products, we want you to be able to access what you need with ease. Our old navigation system was not going to win any fashion awards, nor was it intuitive to use. It would change based on the page you were on, which made navigating our site difficult. Our new navigation is a significant improvement over our old system. The navigation is consistent across the entire site. The menu items are big, graphical, easy to read and easy to click on — helping you get to where you want with a minimal number of clicks. Our website serves many purposes. For current customers, it is the entry point for our site before continuing onto the area they are looking for. For people new to ReviverSoft, it is where they go to research our company and find out about our products. Our website should be a hub of information and navigation options, but it should also reflect what ReviverSoft represents as a company, and what we do. 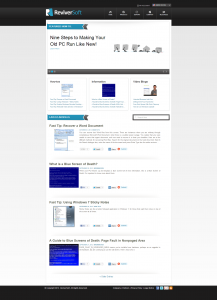 We did not feel that our old home page did this well, so we started fresh and rebuilt it. Our new home page helps you get to where you want to go, while also explaining to people who we are at ReviverSoft, and what we do. There’s also a great new video on the home page that we are really proud of! We really take pride in our blog. It is really one of the areas of our company that we feel really reflects on our beliefs. While the content that we produced in our old blog was great, it was difficult to navigate to and find the content you needed. Our new blog has a great new home page, with featured articles along with the most recent articles from our most popular categories. There is now also a search box that you can use to find anything you are looking for, and with now over 250 posts on a wide range of topics, you are sure to find content to help your situation! Both Registry Reviver and Driver Reviver have received upgrades with new and improved scanning engines, ensuring that they are the best tools you can use for optimizing your Windows Registry and updating your drivers. Driver Reviver and Battery Optimizer also have a new user interface, which incorporates useful computer tips directly into the home screen. We have also introduced new product logos in all of our products. We received quite a few comments from customers who mistakenly downloaded the wrong product because they all looked very similar. Therefore, We’ve introduced a color coded system for our logos that you can see above. The letter on the logo represents the product name. These logos are easy to identify where ever you see them including in the Windows system tray as you can see below. We think these logos looks great, and we hope you like them too! We’re in the final stages of testing some really cool new informational resources and exciting new products that are due to be released very soon. We’re keeping them under wraps for just a little bit longer, but we promise you they are going to be awesome. As always, your feedback is extremely important to us, so we’d love to hear what you think about these new developments. Once you’ve checked out the new website and products, let us know what you think by emailing us at founders[at]reviversoft.com. That’s about it from us for now. We want to thank you for being part of the ReviverSoft community, and we look forward to continuing to bring you the best resources to help you love your computer again!